It was good to see many of you last week. Thanks for letting me join in the fun! I have a quick question: @brooking and I are working with a network with some pretty deep trust issues. We know that transparency in decision-making and sharing information are going to be essential in building this trust back up. In the mean-time, we were thinking of introducing the concept of “radical transparency” to help this group take a leap of faith and share more honestly and openly than they might otherwise. 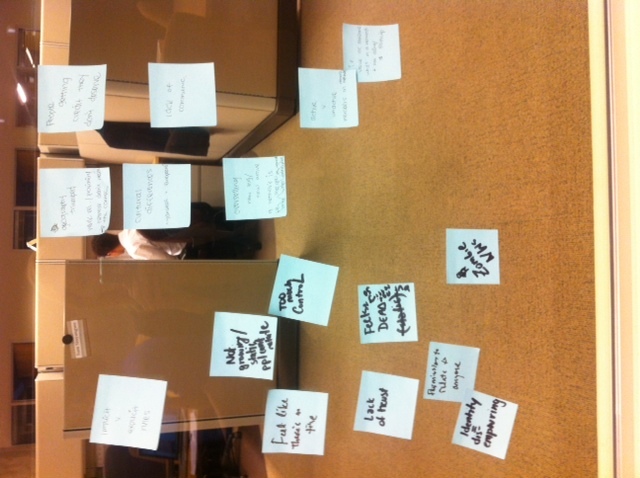 So here’s the question: Do you all have any resources on “radical transparency” that you like? I know it’s a framework that’s been percolating, but it’s not one I’ve had a need to access up until now. In this case, I think an established framework, almost a pedagogy, will help them take a leap. What do you mean by “framework”? I have a blog post I started outlining several weeks ago on this topic. It’s more a series of anecdotes than a framework, but if it might be useful, I’d be happy to accelerate its publication or share the early thinking from it. I was going to get quotes from three past projects on the impact of the radical transparency: Delta Dialogues, CIA, and the international reproductive health work I did in 2008. How else are you addressing the trust issues in your design? That would be super useful Eugene! Look forward to seeing it. 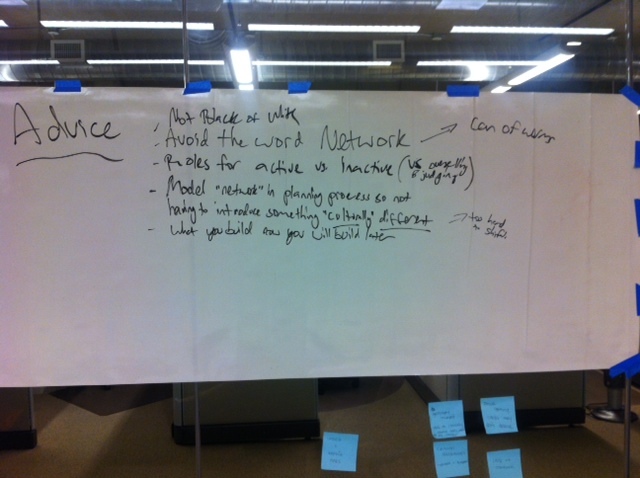 By “framework” I mean a tried approach, a structure to help move people through certain work. I don’t really need a “framework” (we have lots of those), but more of a succinct description of the theory, what a radical transparency approach looks like, and why it’s important. One of the simple things we’re working on is a decision-making dashboard where we track all the decisions that need to be made, and how they’re being made. We’re also investing a lot of time up-front in uncovering motivations so people aren’t making assumptions around what’s in it for others. But this is part of where having some accessible, brief writing on the importance of radical transparency would be useful: time spent on this work is time not spent on other things. It’s different than what they’ve done in other coalitions. They’re bought in mostly, but pointing to the value of slowing down and working transparently in order to go fast later would be helpful. Okay, I’ll flesh out my thinking and share it with you tomorrow. If I get responses back from folks early enough, it’ll be a Thursday blog post. I’ll also share some stuff with you on DRIs (Directly Responsible Individuals), a model used at Apple, Square, and Asana (which I may have shared with you before at some point), and a very rudimentary dashboard that I’ve been using with PostCode (as part of my Code for America experiment). The network mindset stuff I’m doing with Garfield may also help you guys with these trust challenges. We put in a tremendous amount of up-front time pre-screening for the right mindsets with our Design Team, and we’ve still run into challenges. Happy to share more if you’d like. Thanks Eugene! 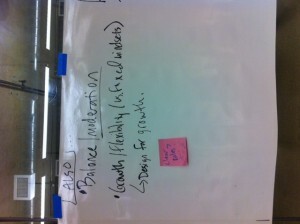 And I’d love to hear more about screening for the right mindsets on the design-team! I think screening and criteria are valuable; and we’re trying to figure out how to do those without perpetuating old decision-making / power patterns. I think clarity and transparency around what you’re screening for is a key piece, but it would be great to hear more about your approach to this. I loved yesterday’s bootcamp. I was so happy to see so many of you there, although I missed @anna341bc and @lauren. 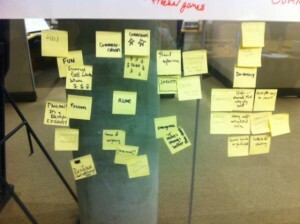 @marie and @eugenechan, you guys did a great job designing and facilitating, and I liked how you co-facilitated. Would love to see more of that! And @brooking, enjoyed our pair conversations! I’ve been sitting on, “I matter,” and the more I think about it, the more I like it as a proxy for thinking about aliveness (with @rapetzel‘s objection noted). Finally, to whomever took pictures of the action, thank you! Was glad to have them, and I even snuck in on a few. I’m assuming it was @eugenechan, but don’t want to make any assumptions! There aren’t any whiteboard pictures there, as I didn’t get them all. Eugene, feel free to upload them to the Google Drive folder, and I can supplement if I have better versions. Thanks again! I’ll email everyone about April and beyond. Thanks @eekim. It was a treat to get to work with @marie. It’s also quite amazing to watch people with high meeting IQs interact in a personal environment. Lots of interplay, some collaborative, some supportive, some dissentive, but all in the spirit of learning. I was fascinated and impressed. I thought that checkins would go way longer than it did. I wonder if was because the group wasn’t as familiar with each other that checkins were shorter. I did take the pictures as you guessed. Excited to hear that @eugenechan and @marie‘s bootcamp has been rescheduled! On that note, I have a number of announcements regarding Changemaker Bootcamp. I have decided to delay doing another pilot indefinitely. I will reassess in July and again toward the end of the year. This was a very challenging decision, and it was not made lightly. I have a strong emotional connection to bootcamp in particular, but I am overcommitted right now, and when I did a cold, strategic assessment of all of my projects, Changemaker Bootcamp (in its current form) did not make a cut. However, there are many, amazing things that emerged from bootcamp that I will continue to support, and in some cases, I want to step up my engagement. I’d like to create a stronger backbone for the self-organized bootcamps. I’d like to propose that we have a self-organized gathering on the first Monday of every month from 4-6pm, alternating locations in SF and Oakland, starting with Monday, April 7 in Oakland. I’d like to propose that we have an open signup for each slot, with me claiming the April slot. It would be first come, first serve, but with a statute of limitation on getting it organized. In other words, if you claimed a spot, but for some reason weren’t able to get it organized by at least two weeks in advance (for example), the spot would be released, and I would claim the spot. This would assure that monthly gatherings happened, and it would reduce the burden on everybody for holding this together. It’s not a bad thing if I get to organize one of these every once in a while, and if all of you are so motivated that I never got a spot, that’s cool too! I’d like to use these gatherings as a basis for inviting a larger community of practice to participate. We should talk more about what this might look like, but I would aim for slow, strategic, organic growth. This will also mean opening up the water cooler to more people. More on this below. None of this would preclude self-organizing beyond these monthly gatherings. I’m trying to find ways to support what’s been emerging without taking control. I hope this proposal strikes that balance, and I’m anxious to hear what you all think. Second, I still plan on publishing both the concept papers I originally planned for my next pilot as well as workouts from previous bootcamps. Sharing actionable knowledge and building community around it is one of my strategic priorities for 2014, and so this needs to continue. In particular, I feel like we’ve gotten away a bit from the original notion of a workout. That’s totally okay. The fact that you all have been organizing and designing these sessions is a form of practice, and I love that it’s happening. The monthly format is also less conducive to the workout format. But I want to make sure I continue to evangelize and support the notion of a regular workout, and this is one way to do that. Third, I plan on rebranding the water cooler as Faster Than 20 as part of my hope to broaden participation. I have several ideas for what this might look like, but I’m interested in hearing what you all would like to see as well. Whatever happens, it will be intentional and strategic, and I’d like it if all of you were partners in that process. Finally, I think it’s important to note that Changemaker Bootcamp (in its current form) spawned a number of things. It’s indirectly responsible for the work I’m currently doing with the Garfield Foundation, and I’m replicating many elements of it in that work. It’s also strongly influenced many of my other projects as well. But the biggest impact it had on me was reminding me why I love this work. I loved working directly with all of you, who inspired me, taught me, and motivated me. I am so appreciative of this, and I hope I can continue to find ways to support all of you. Thanks for the update, @eekim. It’s good to be able to say “No” or “not yet” to things so kudos to you. Glad to hear all the good things happening. I’m not sure about the two weeks or I’ll organize it dictum. It doesn’t seem like this is self-organized. Maybe a better way to set it up is to post a sequence or series of exercises and if an exercise hasn’t been determined within the time frame, the group does one of the posted exercises. I am conflicted about the opening up to a broader participation. I think I understand the motivation–especially if you don’t hold the regular bootcamps this year. However, the current bootcampers have a group history and shared understanding. Maybe you can do an A/B test to see how well it works to have new people in an exercise? Mostly, I’m confused by “gotten away a bit from the original notion of a workout”. I have a sense of what makes a good workout, but it would be good to have guidelines or at least a pattern from you to map against. I also don’t know if you are referring to the exercise during a session, or the structure and sequence of the bootcamps. Unclear. Lastly, you say that it is “okay”, but my guess is that it is not. Otherwise, you would not be proposing these changes. I’d like to know if you want truly self-organized bootcamps or if you want EEK produced, but not EEK directed workshops. That would help me know what makes sense or not to bring to the table. Either way works for me, but having the clarity is important. Thanks for your quick feedback, @eugenechan! I’m going to respond to different points as separate comments, so that they can have their own threads. This one’s about the proposed statute of limitation. Self-organized does not mean leaderless. 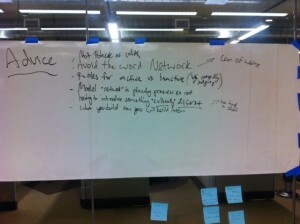 This is the point of my “networks and power” blog post I shared a while back. What I think when I hear “self-organized” flexible structures that encourage shared leadership. I demonstrated leadership by creating an initial space and inviting others to participate. You all have demonstrated leadership by continuing to staking claim to dates, organizing your own workouts, and inviting people to participate. We’ve all been leaving room and respecting each other’s leadership by letting people step up when they’re wanting to step up. It’s a dance, and so far, I’ve been impressed by how well we’ve been dancing. However, we’ve also stepped on each other’s toes on occasion — confusion over who was organizing the January bootcamp, for example, and then nailing a date for the February (now March) bootcamp. So how can we add lightweight structures to address those challenges while not getting in the way of people stepping up? That’s what I’m trying to do in my proposal. By proposing a standard date and location (both of which emerged from this group), I’m trying to address the scheduling challenge. This does not preclude any of us from scheduling different workouts. By proposing the statute of limitation, I’m also trying to address another challenge, which is that sometimes — even with the best of intentions — we can’t follow through with our original commitments. How do you respect this reality, but also leave room for others to step up? I’m offering to be the backup plan, as I thought it was a role that I could play more easily than anyone else. I’m not trying to make some kind of dictum, and I’m definitely open to other potential solutions. Does that help, Eugene? If it still doesn’t feel right, can you say more about what feels wrong about it? Interesting. I see the backup plan as respecting emergent leadership while acknowledging the reality that the drop-outs will happen, and preventing the entire structure from potentially flaming (or — more likely — smoldering) out. Regarding opening up to broader participation, I get that that feels dangerous, but I’ve also heard from many of you that part of the reason you wanted to get involved with bootcamp in the first place was to get more familiar with my network and to be part of a community of practice. I’m wanting to explore exactly that. I have some ideas for how to do it, but I’m totally open. An easy way to handle the face-to-face bootcamps would simply be to give conveners license to invite anyone they want, similar to how @brooking invited @rapetzel. We could try that for a while to see how that goes. The water cooler is a bit more challenging for a variety of reasons. It helps, though, that it’s already a publicly readable space. I’d love to hear what concerns people have, but also what people might be excited about, and then brainstorm together how we might invite more people in. My concern wasn’t that it was dangerous. My concern is that we might lose clarity and cohesion. I’m not particularly bothered by it, but to keep with your bootcamp comparison-when I trained for the marathon, there were varying pace groups that went on the run. If you were new to marathon running, you don’t just join the 8:00/mile pace group or if you did the pace leader made sure that your capacity matched the rest of the group. Inviting @rapetzel isn’t a good example–as she already owns an honorary bootcamp shirt. She is already inculcated into the bootcamp ethos. It’s a fine point, and frankly, I’m not sure that everyone who’s participated in bootcamp so far should be in the same pace group. This is an ongoing exploration for me. But let’s assume that they do. How would you make sure that additional people we invite matched the pace of the rest of the group? I definitely understand the concern about losing cohesion as some of the topics are somewhat sensitive and challenging to work through in a group that might not have as much built up trust. However, as someone who is fairly new to this work, I really appreciate having a variety of levels of experience in the room. It has felt that each person is still able to take away a new learning regardless, but maybe that is my perspective as a beginner? Regarding getting away from my original notion of a workout, the original idea was to repeat exercises that would help us develop individual skills, similar to working out in a gym. Anytime you come into a space with the intention of practicing being and working effectively with others, you’re doing some of that. But that feels more like a scrimmage to me than a workout. The three self-organized workouts have felt more like scrimmages to me. I said it’s okay, because it is okay! Scrimmages are great! Moreover, the people designing the sessions are getting to practice things that we haven’t been able to practice well in my workouts — namely designing and facilitating real meetings — so I’m very excited about that. The self-organized workouts have also been much more content-oriented. People seem to be getting value from that, and that makes me happy too. I see no reason for people to stop doing what they’re doing. However, as part of the group — and I hope y’all consider me part of the group! — I’d still like to give people the opportunity to practice the more repetitive exercises I described above. Again, I don’t think the monthly workouts are as conducive to this, and if I’m only leading one every once in a while, it might not be very practical, but that would be my intention for sessions that I organize. Perhaps no one will want to show up to those! I would really love it if everybody incorporated at least one of the kinds of workouts I’m describing in their self-organized workouts — the two minute drill is an easy and quick one, for example — but I certainly wouldn’t try to impose it on anyone. I want to be clear — and I hope I’ve been consistent in expressing and modeling this — I’m not trying to “take over” what’s been happening. What’s been emerging is already different from what I would have done… and I love it! Like I said, I just want to support it, but also help shape it. I definitely want to hear what other people think, and I am happy to retract proposals if folks don’t think they make sense. Of course you are part of the group! I literally cannot imagine a bootcamp without you. You have given wings to this concept and it is cool thing to be part of. However, you have to define and determine for yourself what it means for you to be a participant in the group rather than a leader, or THE leader. That is the point where things get muddled for me. I don’t see this as “taking over’–I see it as “not letting go enough” Get the difference? I’m happy to see how bootcamps, both self organized and EEK-organized, evolve. I’m glad to be part of the network. I’ve said a lot so I’ll let others chime in. Yup — EEK is definitely part of the group, but I don’t really see him as not letting go enough. That said, I have little desire at this point to step up and get involved in planning and facilitating, so any involvement on his part supports my mouse-in-the-corner position. If I know EEK, though, he’s not about to stand in the way of anyone who wants to actively participate, and that’s why I’m not worried about the “letting go” part. I’ve already expressed I thought the original bootcamp was too short so learning more workouts from Eugene would be great. And I think I need a refresher – what’s the two minute drill? I don’t mind people sharing content based things as long as I’m learning 😉 but I am really interested in the workouts we could do to develop individual skills. I like the idea of having it once a month, I like the idea of it having a stronger backbone- with EEK taking slots that aren’t filled (if it’s not too much of a burden), and I like the idea of broader participation – if there’s a shared understanding of what we are trying to accomplish/do. One main take-home thought for me came from the post-its reminding me to not underestimate the power of FUN in successful networks – the qualities of aliveness, connection, shared values & identity trumping a lot of more tactical things in what makes a network feel successful….. On the “fail” side learnings, it seems you have to first be able to trump barriers to engagement such as lack of time, trust challenges (both re: transparency, relationship building, & excessive control) to get people IN & engaged in your network…and then by the powers of fun, shared vision & realizable benefit you’ve got a chance. I can see how you design for shared understanding/vision & clear benefit of participation, but how do you design for FUN – especially in a digital space? Any follow up practical thoughts/recommendations on that piece are welcome! Thanks for turning this around so quickly, @brooking! I love these takeaways, and I especially love how the whole group converged on fun. This reminded me of a brown bag that @rapetzel and I gave last year on our culture change framework, where the participants surprised us both by focusing most of the conversation on the importance of joy as an explicit value. I feel like I post this one a lot. Definitely let me know if it’s useful and if you think it should serve as the basis of a concept paper. Sometimes, your ability to hit 8 or above has nothing to do with your facilitation abilities. In yesterday’s case, the space we were in was challenging. (I’ve been super appreciative about people’s generosity about providing space — thank you @eugenechan! And, none of our spaces have been optimal for what we’re doing, including space that I’ve paid for. I really need to find a good, ongoing space for us.) That said, the way you guys configured the space showed a lot of skill. Rollaway whiteboard — brilliant, and something I’m going to steal. Post-Its for the synthesis — excellent. Having all of us on the same side of the table — excellent. I really appreciated the level of conversation. You guys picked a hard topic and a hard framing. I didn’t say anything before, but I was skeptical about how deep we would be able to get. However, we were able to develop some shared understanding of “high-performance networks” without getting totally sidetracked by it, and we were able to get into some useful strategic and tactical discussions. Personally, I feel inspired to write a blog post about some of the things we discussed. I particularly liked everyone’s contributions. I think the skill and number of participants really contributed to the success of the bootcamp. I would have been interested to have seen how this would have turned out (and how Brooking and Rebecca would have handled it) if we had two or more additional people. I feel like we hit most of Brooking and Rebecca’s goals. I think we missed on, “Participants gain insights on design thinking techniques,” although I also question the framing of the goal. Is “design thinking” being used here as a catch-all for the kind of tactical techniques you might use in any group process? The two that I can’t answer and that I’m curious about are: Did we hit Brooking’s goal around timeliness (we can have a long conversation about this), and were Brooking and Rebecca surprised by what they learned? From a workout perspective, there were several things I appreciated. First and foremost, the act of designing and facilitating any of these is practice, so I’m very glad that this continues to happen, and I’m looking forward to other bootcampers designing and facilitating future sessions. Second, even though I didn’t like framing the opening question around “high-performance networks” (although I agreed with the decision), the overall framing question was strong in that you started with personal experience as opposed to abstraction. (This is one of the lessons from the person-on-the-street workout.) Third, I liked the pairs exercise, and I especially appreciated Brooking’s framing — “We’re going to be exercising our listening and synthesis muscles.” That felt very much in the spirit of bootcamp. I’m always amazed by how much of a difference moving into pairs can make. It requires skill to make that move with such a small group, but group physics doesn’t lie. From a bootcamp perspective, I would have rather seen less up-front talk about Health eHeart. 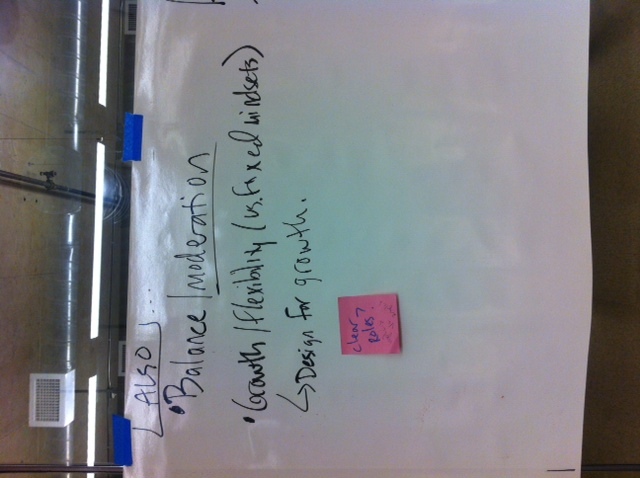 However, I’m also conscious of @eugenechan‘s feedback (he liked the groundedness of starting with a real project). This was essentially a peer consultation, and from a community of practice perspective, peer consultations are wonderful. I think we could have reached a middle ground, but I’ll reserve that feedback for my comprehensive debrief. What did others think? I focus a lot on process above, so I’d love to hear what people thought about the content. What did you learn? What muscles do you feel like you exercised? Thanks SO MUCH for this feedback EEK – I love that for you this is the “short” version 😉 I’ll be posting photos & some synthesizing thoughts this evening or tomorrow… thanks again everyone for participating!!! Not sure you got this from our conversation… It may be a really useful PRE-READ / HOMEWORK to have participants reflect on some of the topics we discussed… What does a network mean to them… OR What are they hoping to achieve (in a picture)… I once had participants respond to a question: “what is the impact of art on quality of life?” on a posterous blog with pictures prior to getting together, and it was a great kickoff. I’m super excited to see the energy around self-organized bootcamps! To help with the organization, I created a spreadsheet where people can sign up to host. You all should have access to edit; if you don’t, let me know. Looking forward to next week’s gathering with @brooking and @rapetzel! Change the name to Collaboration Bootcamp. Make it eight weeks instead of six. Stricter requirements around participation. Specifically, you can still miss up to two, but you can’t miss the first session. Concept papers. Lots of folks have requested more theory / teaching / Eugene-time. I am reluctant to do this during the two hours we have together, as I want to focus that time on practice. 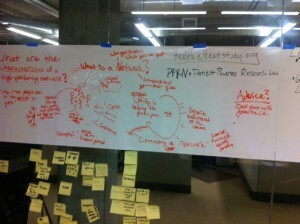 To try and accommodate, I’d like to write a series of two-page concept papers for everything we do at Bootcamp. I’m always willing to have followup conversations after the sessions, preferably here but also scheduled individually. I’m anxious to innovate around the last point above. It’s flattering that there’s a demand for more me-time, and I want to meet that demand, but I don’t want to fall back on traditional modes of “teaching.” Would love to hear people’s ideas. Finally, @jessausinheiler has asked a number of times about the difference between Changemaker Bootcamp and my new website, Faster Than 20. Faster Than 20 is simply an online home for my writing and my experiments. Changemaker Bootcamp is one of my experiments. It has its own website, this water cooler, etc. There are reasons for this, but there are also challenges: Namely, a lot of the stuff on Faster Than 20 is directly relevant to Bootcamp, and the way it’s currently setup requires people to go to two different places (an example of bad use of online group physics). It’s always a tradeoff, but I want to experiment with that line. As a small step, I’m thinking about making this water cooler part of Faster Than 20 rather than exclusively for Bootcamp. It would allow me to broaden the participant list as well. What do you all think? As a bigger step, I’m thinking about dissolving this website entirely, and just integrating the content with the Faster Than 20 website. Thoughts? I like Changemaker Bootcamp more. “Collaboration” seems more like a method to me. Concept papers can be good–not sure until I get a sense of what exactly you are proposing. Ooops, I hit send a bit too early. You have 3 places where you post things: eekim.com, changemakerbootcamp, and now Faster than 20. Even though it might be clear in your mind as to the differentiation, it isn’t as clear to me. Especially since it is all “just you” at the moment. The difference between eekim and the other sites makes more sense. But between Faster than 20 and Changemaker is not so clear. The name “Changemaker Bootcamp” is also more concrete than Faster than 20. Thanks for the quick feedback, @eugenechan! This is helping me think this through more carefully. For example, with the power workouts, I didn’t offer any feedback on how to think about power. All of that came from all of you exercising the muscles you already had, then debriefing with each other. The same was true of the difficult conversations workout. With a concept paper, I might offer some tips and point you all to other places to learn more. Would love to hear what others think. Hi EEK – love the innovations, all of them actually feel like good moves to me. Re: further innovation ideas for the last one, I wonder if you’ll choose to hand out the concept papers before or after – before would satisfy those who like to enter w/ a clearer frame for practice; after would satisfy the desire to have more exploratory practice experiences. I wonder about giving out brief hand-outs before the exercise, and further explanation hand outs after (or on water cooler after) for integration. Another idea is to assign a boot camper the 2 pager and have them take 5 minutes to present the idea to the group, which gives them practice opportunities to work on communication skills and may feel a more valuable way for you to offer frameworks & more of your thinking, but still have it be focused on the bootcampers’ learning & practice experience and not you talking…. Re: website: I like having them as separate sites, and more-over think the bootcamp as a closed group is a good thing and benefit of paying to join the boot camp. Having the watercooler be more open feels more vulnerable and makes this a less safe space I think for some of the more personal conversations, which to me is a loss…. Thanks, @brooking! I wonder what I’ll choose too. 🙂 My inclination is to simply make the concept papers available in advance and give people the option. It’s consistent with my philosophy that workout time be devoted to practice and feedback. I like the idea of having bootcampers (rather than me) present for the reasons you list. However, I’m concerned about the time it would take away from the main workout. Appreciate your vote on keeping the websites separate as well as the feedback on open vs closed watercooler. There is no question that a closed group is safer than an open one. The key question is, to what degree? What would be happening here if this group were closed that’s not happening right now? What’s happening right now that wouldn’t be happening if this were closed? Well worth an experiment to articulate, then test some hypotheses. I love the idea of concept papers — before and after. Before as a way to gather your thoughts AND practice presenting. After as a way to reflect on the progress you’ve made, and get feedback on your high-level plan. I, like Eugene C., like the idea of integrating the sites. I appreciate @brooking comment on the intimacy of the group but–personally–would welcome any one who happens to be on the FT20 site and wants to join our conversation. (And the site is currently “open” anyway). Looking forward to seeing everyone on 1/14. Thanks for the feedback, @jessausinheiler, and glad you can make it on Tuesday! I am almost certainly going to integrate some kind of discussion functionality into Faster Than 20, as it’s already turning into a touch point for all of my different communities and projects, and I’m wanting to integrate them. Still uncertain as to whether to make this water cooler that, but the feedback is helpful.